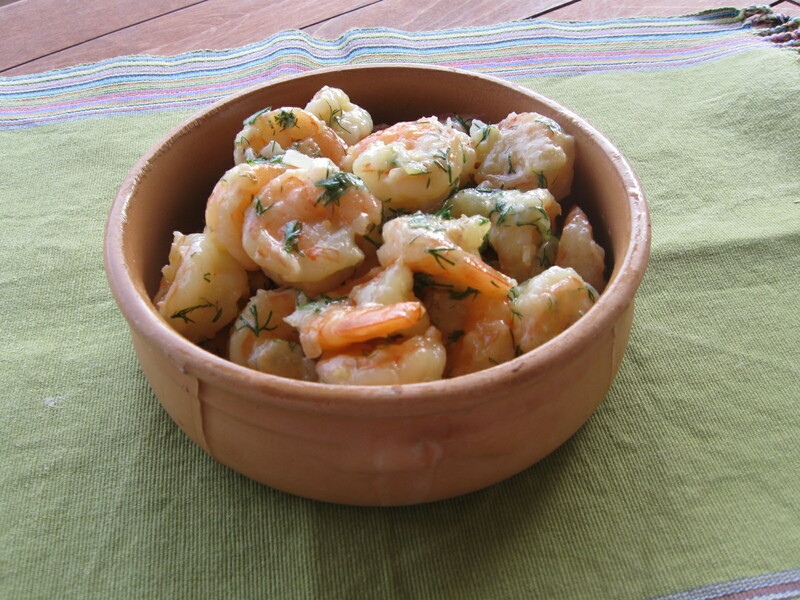 This is the quickest, yet yummiest, shrimp recipe. All you need is onion, garlic, olive oil, lemon, and dill and it takes about 10 minutes to make. Just be sure to keep a bag of frozen shrimp handy in the freezer. How to make: I buy frozen shrimp that is either entirely clean or with just the tail on. Where I shop, the shrimp does not need vein removal, which is important for a busy mum. Always check for veins, though, and remove them (see notes and tips). Now on to the cooking. Heat the olive oil in a deep pan. Saute the onion first. When it’s almost done (low heat, about 5 minutes), add the chopped garlic to flavor the oil. Saute for just a minute or two. Add the shrimp. Saute the shrimp on all sides until it’s all nice and red, about 5 minutes. Squeeze a lemon on top, give it a stir, and turn off the heat. Serve with plenty of dill and lemon zest. Notes and tips: To remove the veins from the shrimp, use the tip of a knife to make a superficial lengthwise on the top part of the shrimp, head to tail. If there’s a vein, it will be there and you can’t miss it because it’s dark. Remove the vein and wash.